The Wild Rock Wine Company is owned by Craggey Range, one of the top producers in New Zealand. 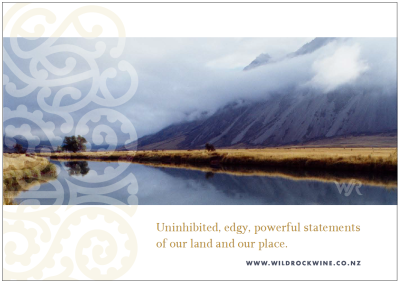 Wild Rock is a producer of regionally diverse wines from a combination of owned, leased and contracted vineyards in Hawke's Bay, Martinborough, Marlborough and Central Otago. From the 'Wild White' (Sauvignon Blanc) to the 'Just Pinot', Wild Rock's modern, unconstrained and memorable collection of wines speak uniquely of New Zealand and showcase some of the county's best known varietals. Hawkes Bay is blessed with a diverse range of soils and microclimates that create endless possibilities for winegrowing. In the cooler coastal and river terraces suit finely flavoured and aromatic Chardonnay and Pinot Gris.The Gimblett Gravels Winegrowing District is also located here. It's the countries warmest place to grow wine and home to Syrah, Merlot and Malbec vineyards. In Martinborough, a handkerchief sized pocket of New Zealand's North Island, where it seldom rains Wild Rocks vineyards are in the driest and most rocky part. Pinot Noir is planted along the old river terraces. Just south of Martinborough, at the tip of the South Island is the world renowned Marlborough region, the New World's home of Sauvignon Blanc. The vineyards lie in the young, stony soils of the Wairau Valley, an area that produces pure, intensely flavoured grapes of exceptional quality. The ruggedly beautiful Otago region is the world's most southern winegrowing district and the birthplace of Cupids Arrow Pinot Noir. This dry, sunny and almost continental climate produces highly aromatic, wildly flavoured, softly textured wines that are without a doubt, unique and special. ​Respecting the environment is key to ethos in Wild Rock Wines because it is about protecting Wild Rock and ensuring the continued creation of award winning, world class wines for generations to come. Sustainability and outstanding wine quality go hand in hand. The wineries are SWNZ accredited and grape processing by-products are retained for composting and, ultimately, return to the vineyard.